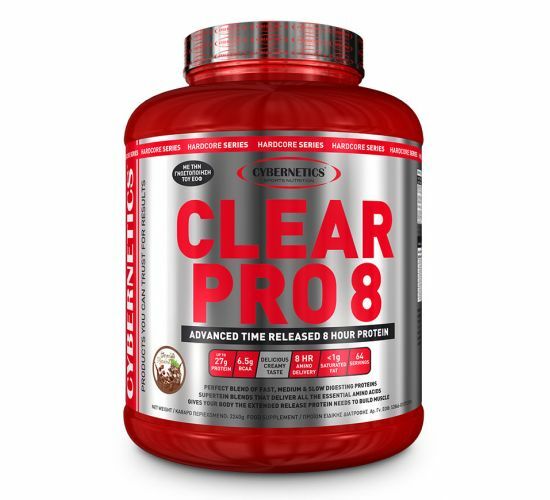 CLEAR PRO8 is a protein blend provides fast, medium and slow-releasing proteins in one advanced formula that also contains a patented method of extending the release of amino acids for up to 8 hours. It provides 27g of protein in each serving and delivers 6,5g of branched-chain amino acids to recovering muscle for up to eight hours. Each great-tasting flavor mixes up rich and thick like an ice cream milkshake. CLEAR PRO8 contains a combination of milk, whey and beef protein, which can promote exercise recovery and muscle growth. With the highest amount of protein and only 1,6g of sugar and 0,8g of saturated fat, it's a great way to deliver muscle-building proteins into your diet.